This week I put the finishing touches to ‘Touch the Join’; the end papers were glued to the boards and I completed the dust jacket. The volume now awaits a place on the top shelf of my cabinet when its current contents are digitised in the Electronic Story Book journey. The creation of the dust jacket was particularly Interesting. The thickness of the book meant that there was considerably more space on the spine to do things that perhaps wouldn’t work at all in a narrower area. I decided to use the space to illustrate the title, so I took lots of photos of my fingers touching the bare leather spine and embedded the title in one of them with the result shown below. The other two pictures on the spine are taken from within the book itself along with the other sixteen images that appear on the front and back of the jacket – all assembled in a PowerPoint slide. Fingers have been superimposed in another two of them to reiterate the message of the title. The front and back of the dust jacket are shown below. ” In the years before retiring in 2012, I had accumulated a number of projects that I didn’t have time to work on. Things like the analysis of why I kept certain documents after scanning and not others; and the comparison of my incoming communications between 1981 and 2011; and the Roundsheet. As retirement approached, I began to realise that I could undertake all of these and more under a collective banner; and that, for some of them, I might be able to find collaborators, academic or otherwise, to advise me or to work with me. I thought of these as prospective journeys of discovery, unfettered by organisations or money. To provide a structured framework within which to work, I decided to record a journal for each journey; and to set up a website to provide an open record of my activities for prospective collaborators to see what I was doing. Consequently, in April 2012, pwofc.com opened for business. One of the journeys I embarked on was digital preservation work on my lifetime collection of work documents, to ensure that its contents could be accessed in the future. The collection includes some self-contained web sites, so I investigated the best way of storing web sites long term. However there appeared to be no simple solutions. The industry standard WARK methodology seemed far to complex for my needs, so I stuck to the approach I had always taken – keeping all the files together in a zip file. 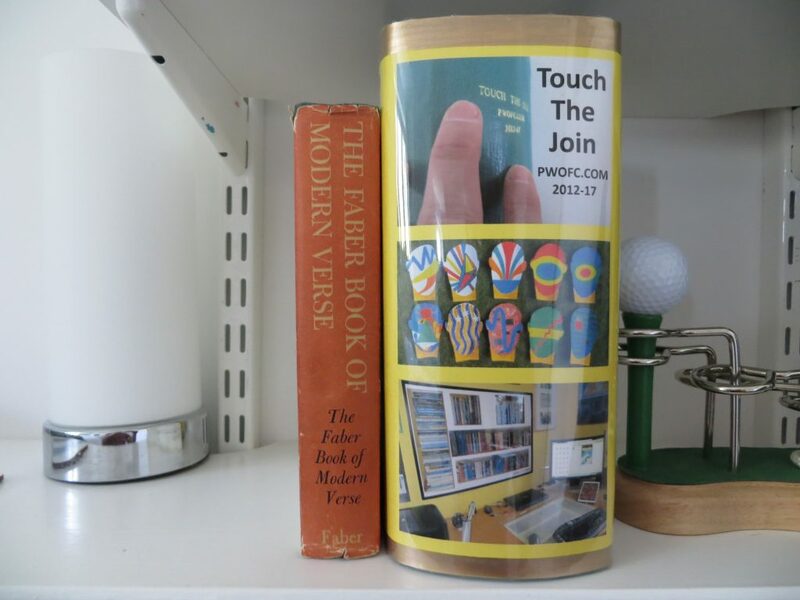 However, it did get me thinking about how to preserve pwofc.com; and I suddenly realised that a more tangible way of doing it would be to simply put it on a bookshelf. 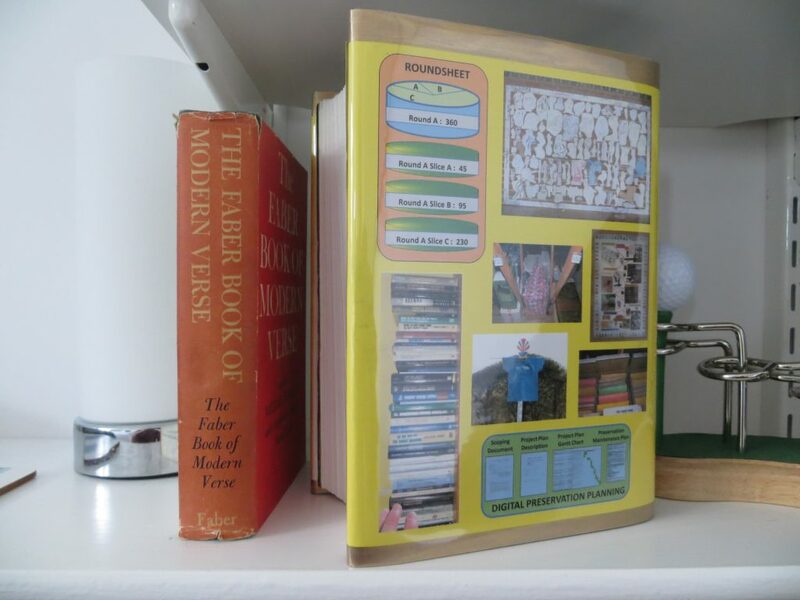 I had started attending bookbinding classes in Bedford in 2017, and I had already created, printed and bound a book of my own (Sounds for Alexa), so I knew it would be possible. I realised, also, that it would be an interesting opportunity to compare the features of a web blog and a book. The printing of the dust jacket was quite demanding because its length (60cm) required a custom print size to be set up in the canon MG3550 printer driver software; but the printer driver software does not permit Borderless Printing with custom print sizes. Hence it was not possible to avoid getting a 0.5 cm blank edge all round the print. Furthermore, the height required was exactly the widest the Canon MG3550 printer was physically capable of handling (22cm) but the printer driver software only permitted a custom size of 21.59 cm, so a further 0.41 cm of blank space was introduced on the top or bottom edge. I produced 4 separate test prints and each time tried to get an equal amount of blank space on the top and bottom edge by moving the image to be printed up and down; but wasn’t able to achieve it, so I ended up with a larger space along the top edge and a smaller space along the bottom edge. I didn’t think this would look very good, so decided to fill the blank edges with gold wax gilt by using masking tape and applying the ‘KIng Gold’ version of Pebeo’s Gede guilding wax using a small paint brush with the hairs cut down to a length of about 5mm. A further complication arose when trying to wrap the dust jacket around the book with the spine in the appropriate place. Because of the size of the book and the length of the dust jacket it was necessary to handle the print quite a lot to get it in the right place, and I found that some ink was coming off on my fingers. Despite experiencing this on the test prints and then being super careful with the final master version, some ink smears still found their way onto parts of the jacket. I’ve decided I’ll live with these for the time being. Perhaps, at my leisure in the future, I’ll have another go and leave the print for a few weeks in the hope that the ink fixes more securely. Finally, covering the jacket with a sheet of transparent plastic (probably polypropylene) was relatively straightforward – just cut to size with several centimetre overlap all round and then fold over the top and bottom edges of the dust jacket. However, there’s an issue with using this material that I havn’t yet found a way to resolve: the plastic attracts all the dust and hairs that are already lying on the surface on which you cut it and fold it. I guess if I had a dedicated workbench which I could keep immaculately clean, that would do the job – but I don’t and have to make do with whatever area I can find that’s large enough to take an expanse of the 80cm wide roll. 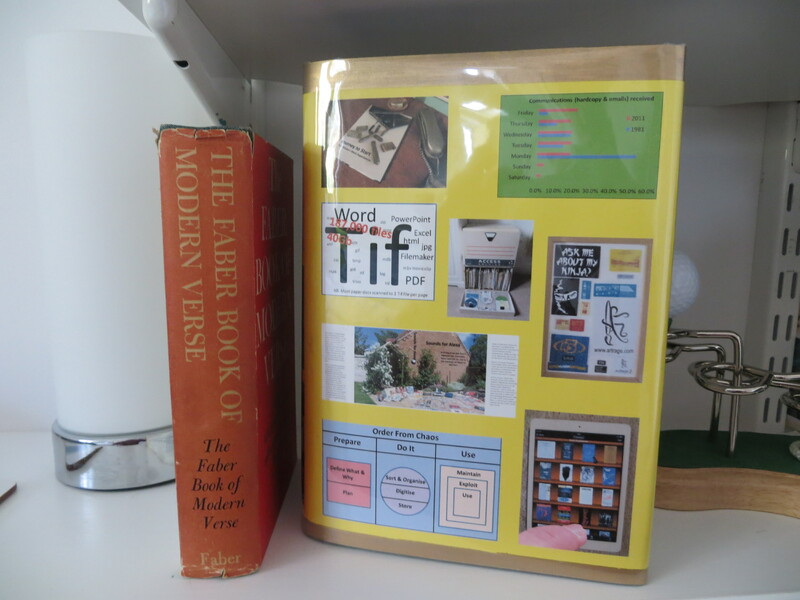 Consequently the outside of the cover had lots of bits on it which I have tried to remove using a damp cloth. However, there may also be bits on the inside of the plastic. Luckily, once the covered dust jacket is on the book, such bits are not immediately obvious to the casual eye. So, that’s the whole story of the book of the blog. Perhaps there’ll be an accompanying volume in a few more years.